Disclosure: I received a product to help facilitate the review. All opinions stated are genuine and my own. You can find the review here. Essential Oils deliver an aromatherapy delight in your shower! 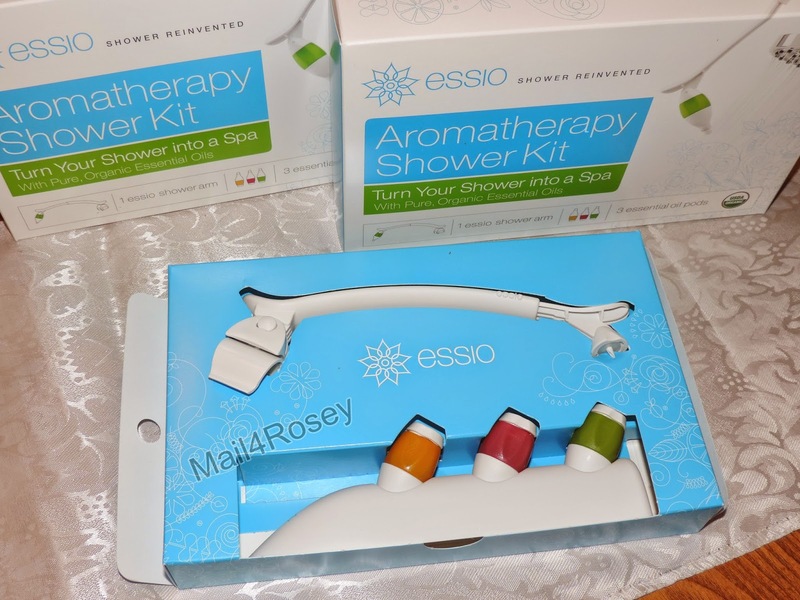 I just wrote a review on the ESSIO Aromatherapy Shower Kit...the perfect way to have the luxury of a spa treatment, in your own home! You can read the review here, where you can also enter for the chance to win a kit of your own (until Feb. 11)...and you can enter here as well (until Feb. 23). That's two fabulous chances to win! For those who will be purchasing a kit of their own, all Mail4Rosey readers will get a 20% off discount by entering the code 20ForYou at checkout. Visit ESSIO on their website. You can also follow them on Facebook, Twitter, and/or Pinterest.US entrants only. I love how you can adjust how much or little comes out in the shower! I love that ESSIO aromatherapy blends don't have any synthetic fragrances or any other artificial ingredients. I like how easy it can hook up to the shower head . I love that you can adjust the amount that comes out, and it's diffused into the air rather than under the spray of water. Read the review, thanks for the chance to win one. Entering now! Oh I've seen this! This looks great! I'd love to win this! That is really cool. I love using essential oils. This is so cool! Perfect for waking up on early mornings! I have such an old shower head I wonder if this would actually attach to it. I would definitely like to experience aromatherapy in a nice warm shower. I bought this starter kit for my best friend for Xmas. She is really enjoying it and loves the breathe scent. I love that you can control how much essential oil is used...I would like a lot more than hubby. Also love how the oils are organic...so much better to put on our bodies and breathe in! That is really cool. I like using essential oils. I like how you can control the amount on it! Awesome!! I would love this for my shower! I would like to try the essential oils. I like that the oil doesn't spray into the shower. I like that it clips on standard showers... would hate to think I had to go buy a special attachment. Aromatherapy is an important part of my chronic pain management. I love that I can start and end my day with this product. That sounds like something that needs to be added to a home pampering sesh! I like that it can be adjusted to put out a little, or a lot. That you can use the oils in the shower. Sounds soothing. Can you also moisturize your skin? I like that it doesn't require any tools to install. I like that it doesn't leave residue and is easy to use! This is great. I've read so much about essential oils, but never thought about using them this way. It's such a great idea. I love that it goes into the air so there's no oil on you. I DEFINITELY love that there are essential oils used! I learned how it is diffused.. So interesting! I can't wait to try it! I learned you can get $10 off your first order. I like that the oil doesn't get on you. It is diffused using patented technology that leaves no oily residue on the skin or hair. I already have very oily hair. I though that it's cool that they are 100% organic and can be adjusted in the shower to offer a little, or a lot. I like that you can just clip it to your standard shower. I Love that the scents are organic and that it is easy to install! i like the infusion of water with essential oils. There is no residue on hair or skin. I love how easy it is to attach and that you don't need to do much since it infuses with the water with the oils. I like that they're 100% organic. I learned that the oils are 100% organic and I learned that ESSIO has 6 unique combinations of 100% therapeutic-grade organic essential oils. I love this so much! I like that you can use it or not, depending on if you have the time or not for relaxing. I also like that it leaves no residue.